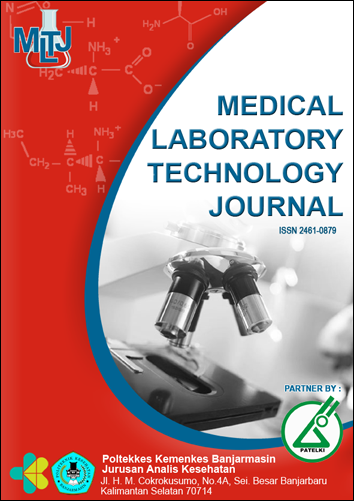 Medical Laboratory Technology Journal, with registered number ISSN 2461-0879 (online) is a scientific journal published by Poltekkes Kemenkes Banjarmasin in cooperation with PATELKI with the MOU. The aim of this journal publication is to disseminate the conceptual thoughts or ideas and research results that have achieved in the area of medical laboratory sciences. This Journal particularly focuses on the main problems in the development of the sciences of medical laboratory areas. It covers the parasitology, bacteriology, virology, hematology, clinical chemistry, toxicology, food and drink chemistry, and any sciences that cover sciences of medical laboratory area. Please read these guidelines carefully. Authors who want to submit their manuscript to the editorial office of Medical Laboratory Technology Journal should obey the writing guidelines. If the manuscript submitted is not appropriate with the guidelines or written in a different format, it will BE REJECTED by the editors before further reviewed. The editors will only accept the manuscripts which meet the assigned format. Medical Laboratory Technology Jornal has been accredited by Ministry of Research, Technology, and Higher Education of Republic of Indonesia with grade 3rd according to the decree No. 21/E/KPT/2018.